Evolutionary thanatology benefits from broad taxonomic comparisons of non-human animals' responses to death. Furthermore, exploring the sensory and cognitive bases of these responses promises to allow classification of the underlying mechanisms on a spectrum from phylogenetically ancient to more derived traits. 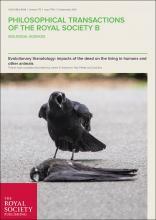 We draw on studies of perception and cognition in invertebrate and vertebrate taxa (with a focus on arthropods, corvids, proboscids, cetaceans and primates) to explore the cues that these animals use to detect life and death in others, and discuss proximate and ultimate drivers behind their capacities to do so. Parallels in thanatological behaviour exhibited by the last four taxa suggest similar sensory–cognitive processing rules for dealing with corpses, the evolution of which may have been driven by complex social environments. Uniting these responses is a phenomenon we term ‘animacy detection malfunction’, whereupon the corpse, having both animate and inanimate attributes, creates states of fear/curiosity manifested as approach/avoidance behaviours in observers. We suggest that integrating diverse lines of evidence (including the ‘uncanny valley’ effect originating from the field of robotics) provides a promising way to advance the field, and conclude by proposing avenues for future research.This article is part of the theme issue ‘Evolutionary thanatology: impacts of the dead on the living in humans and other animals’.